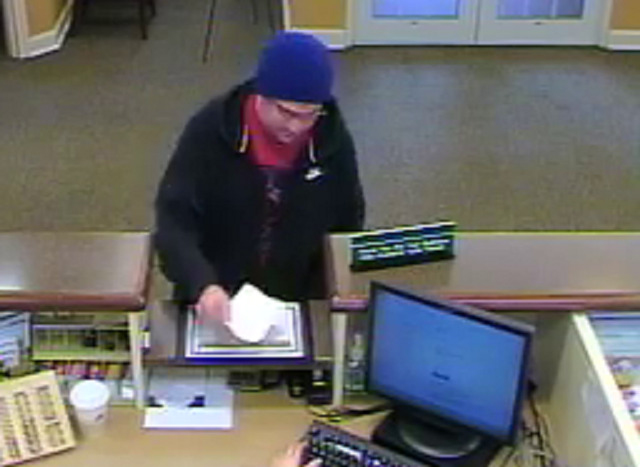 The Camden County Prosecutor’s Office and the Voorhees Police Department are seeking the public’s assistance in identifying a man who robbed a bank today. The suspect entered the Fulton Bank located at 6 Haddonfield-Berlin Road in Voorhees around 11:07 a.m. on Monday and passed a demand note to a teller. He received an undisclosed amount of cash and fled in what is believed to be a silver vehicle. No weapon was displayed and no one was injured. The suspect is described as a white male about 20-to-30 years old who stands approximately 5’10’’ and is of medium build. 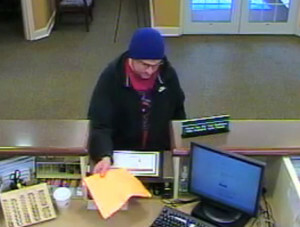 He was wearing a blue ski cap, a black zip-up hooded sweatshirt, a red shirt, clear glasses, blue jeans and white sneakers. Surveillance photos of the man are posted below. Anyone with information is urged to contact Camden County Prosecutor’s Office Detective Mark Cunard at (856) 225-2507 or Voorhees Police Detective C. Fowler at (856) 428-5400. Information may also be emailed toccpotips@ccprosecutor.org. Released Monday, April 4, 2016.